When the brakes are applied, the brake pads are forced against the brake rotor, which causes friction and heat.This is what slows down and stops your vehicle. 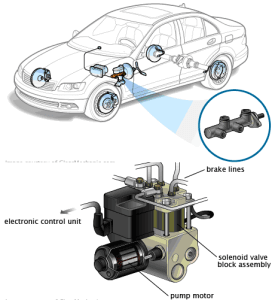 The cost to repair Mercedes brakes varies from model to model. Brake repairs are commonly offered at Low ball promotional prices that may be lower than the Repair Price Estimate. Make sure you understand exactly what parts and service is included in your estimate for repair (keep in mind tax and fees). German Car Depot only uses factory or OEM brake pads and rotors disks. A small amount of brake noise when lightly applying brakes is normal. Since brake pad material wears out over time, the pads should be inspected periodically. Most Mercedes Benz Front brake pads are about 12mm when new and can be driven to about 3mm of thickness. Rear pads new are about 8-10 thick mm and can be driven till about 3 mm. At German Car Depot we measure your pads every time your vehicle is lifted. We keep a record of your brake pad thickness and send you reminders. By using this proven method our customer will not wasting money by replacing pads way before they are due. The brake fluid should be serviced every two years. This should include a complete inspection, and moisture reading of the brake fluid . Fluid should be under 2% moisture and clear in color. Then a complete bleeding flushing of the system. Brake rotors If you change your brake pads before they get too low, you can save your rotors as really low brake pads will damage your rotors. Mercedes Benz brake rotors machined by to the manufacturer’s then heat-treated .They cannot be safely machined Your If your vehicle has any pedal pulsation issues, you may be better off replacing worn rotors. We recommend braking gently for the first 40 to 50 miles of driving on new pads. This will allow them to adjust to the rotors and help prevent squeaking. German Car Depot only replace in pairs and the brake hydraulic system flushed. Brake fluid is a specially formulated fluid that transmits the pressure generated by the master cylinder to the calipers and/or wheel cylinders when the brake pedal is pressed. Brake pad wear sensors are attached to the brake pads. They will trigger a warning on the instrument cluster when the brake pads have worn down to the point unfortunately when the pad light comes on the pads are usually grinding on the rotors . You might need to change the rotor, pads and sensors. Illumination of the brake pad wear warning indicator ignoring the brake pad wear indicator may result in damage to the brake rotor(s), and in extreme cases, the brake caliper(s)Electrical brake wear sensors need to be replaced along with the brake pads. 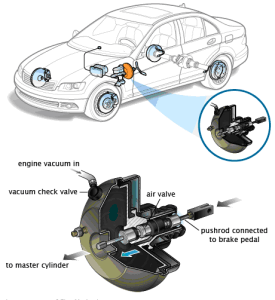 When the brake pedal is depressed, the brake master cylinder responds by generating the hydraulic pressure necessary to operate the braking system. A defective brake master cylinder can set a diagnostic trouble code and cause a warning light on the dashboard to illuminate. A sinking, spongy or unresponsive brake pedal is the result of a failing brake master cylinder. It may also feel like the brake pedal goes all the way to the floor when braking. This could indicate an internal leak. This is a serious fault with the braking system. Do not drive the car if this happens and please call German Car Depot to schedule a towing pick up. The hydraulic brake system is sealed, so the fluid should stay at a constant level. If the fluid goes down, there is probably a leak. Also low levels of brake fluid in the master cylinder could indicate worn out brake pads. As brake pads wear down the fluid will displace to the brake calipers which causes the low levels. 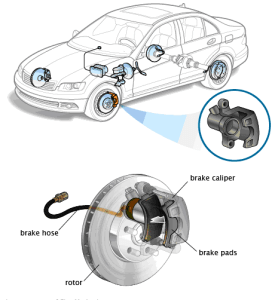 Problems elsewhere in the brake system can cause symptoms similar to a defective brake master cylinder, including stuck calipers and ABS valve bodies. We recommend Flushing brake fluid every two years or when the Fluid has more than 2% moisture content At GCD we measure the moisture every time your car is inspected. This can extend the life of your brake master cylinders. 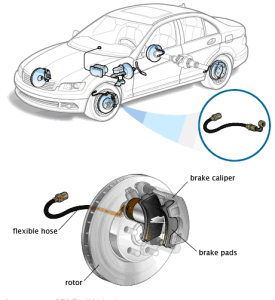 When the brake pedal is depressed, the brake caliper uses the hydraulic pressure generated by the brake master cylinder to squeeze the brake pads against the brake disc. This clamping force slows down the wheel. The flexible brake hoses attach the rigid metal brake lines to brake calipers and sometimes abs Hydraulic units. This allows free movement in the wheels and the suspension. The brake pedal effort can feel normal, but the Mercedes will not stop correct. The brake booster is mounted between the brake pedal and the brake master cylinder. It helps reduce the force the driver must exert against the brake pedal in order for the brakes to work. Тhe hub assembly connects the suspension knuckle to the wheel. It includes a sealed wheel bearing and the mounting hub for the wheel. Signs of worn wheel bearings or hubs. Grinding or groaning noise from the hub bearings while driving, especially when turning. In cases where the brake rotor is mounted on the hub, the hub should be kept free of rust and debris to provide a smooth mounting surface for the brake rotor. 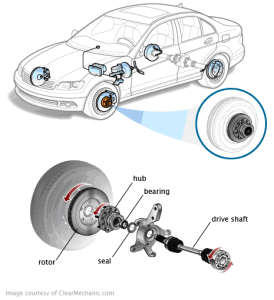 If the car hit a curb or the hub is warped you can feel it when braking.Bearing failure may require replacement of the complete hub assembly. Most new Mercedes-Benz are equipped with an electric parking brake. This brake is released automatically when the driver ends parking mode with the aim of moving off. Usually a switch on the center console can turn it off and on. when performing Mercedes Benz Brake Job repair shops must have special Mercedes-Benz diagnostic computers to retract the brake pads and to calibrate the new brake pads after changing the brake pads. 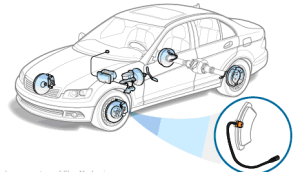 At German Car Depot we have seen many MB come in with faulty rear parking brake motors. After speaking with the cars owner they usually say they went to a non mb specialist .To Change the rear brake pads on most modern Mercedes Benz it takes knowledge and equipment to do a proper brake job.